Last year I noted the Trump administration’s Hippocratic approach to regulation: first, do no harm. I praised the approach toward regulation and deregulation as articulated by Neomi Rao, administrator of the Office of Information and Regulatory Affairs in the Office of Management and Budget. 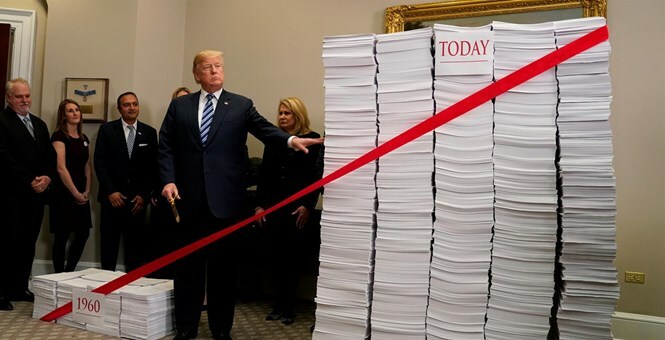 When reviewing regulations, we start with a simple question: What is the problem this regulation is trying to fix? Unless otherwise required by law, we move forward only when we can identify a serious problem or market failure that would be best addressed by federal regulation. This administration adheres to these principles and has particularly focused on reinforcing the rule of law when setting regulatory policy. Agencies across the federal government must realize that they do not possess the authority to create laws; they simply enforce the laws Congress has passed and the president has signed. The administration also aims to restore greater transparency and respect for the constitutional values of due process and fair notice. This includes limiting the improper use of guidance documents. Agencies should not impose new obligations on the public in a news release, blog post or speech, but instead must use statutory rulemaking procedures that provide public notice and an opportunity for comments. For anyone interested in the details of the administration’s efforts, Brookings Institute provides a handy Deregulatory Tracker. As for Rao’s mention of “guidance documents,” if you haven’t heard about that particular kind of regulation by implication rather than proper rulemaking, you can read about it here. As you’ll recall, Pres. Obama boasted of needing just “a pen … and a phone” to implement his agenda without Congress; this was one way he went about it. He just didn’t realize such diktats would still be subject to being blocked under the Congressional Review Act.